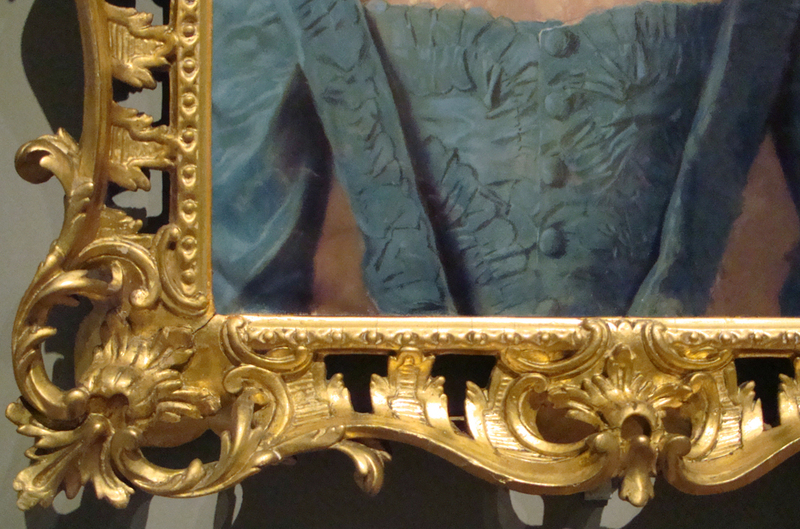 The frames of many oil paintings are often ephemeral parts of the artwork. In large collections they have frequently been exchanged for livery models or switched by curators seeking a more contemporary context. With pastels this is less often true: because of their delicacy, pastels tend not to be reframed quite as indiscriminately as oil paintings or watercolours, and we can assume that some possess the original frame, fitted upon their completion. Similarly, since they were well known to be delicate, many patrons were content to leave the framing of pastels to the artist rather than to arrange it themselves, so that we find some works recognizably retaining the artist’s own distinctive frame pattern . With this thought in mind, I was looking forward to the exhibition of Liotard’s art at the Royal Academy, hoping to see some fine examples of 18th century framing from around Europe. A number of the frames for his pastels are magnificent models of Rococo craftsmanship, displaying the woodcarver’s art in its highest form. 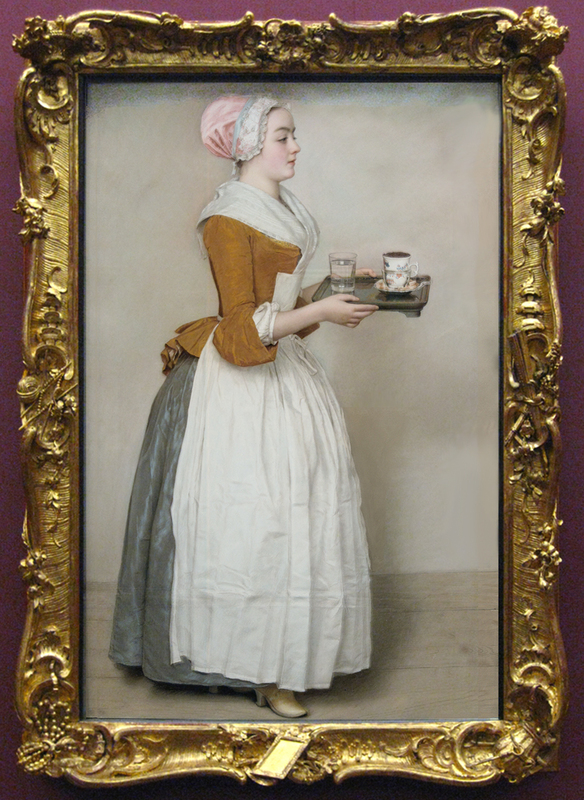 Probably Liotard’s most famous pastel is La belle chocolatière (sadly, however, not a part of the Royal Academy exhibition), the setting of which is frequently cited as an exemplum of the Dresden Rococo style. This frame was one of several hundred produced for the court of Augustus III in Dresden by the master carver Joseph Diebel, when the royal collection was completely framed and reframed – mainly in a uniform livery design – from 1747-52 . Interestingly, it is one of the percentage of the collection which was given its own individual version of the otherwise blanket design: it boasts a vivid and idiosyncratic trophy frame, in which rocailles and other ornaments are depicted in a display of virtuoso carving which arguably raises the status of this frame to that of a unique piece of sculpture. Diebel’s skill is demonstrated in the floral stems which twine around the swept rails of the top edge, and in the corners and centres, which are embellished with exquisite carvings of domestic objects, such as a piece of knitting, a fan, a looking-glass, a flower basket. The result is a frame which is an example of supremely decorative Rococo art, and at the same time complementary to the feminine and modest subject-matter of the painting. 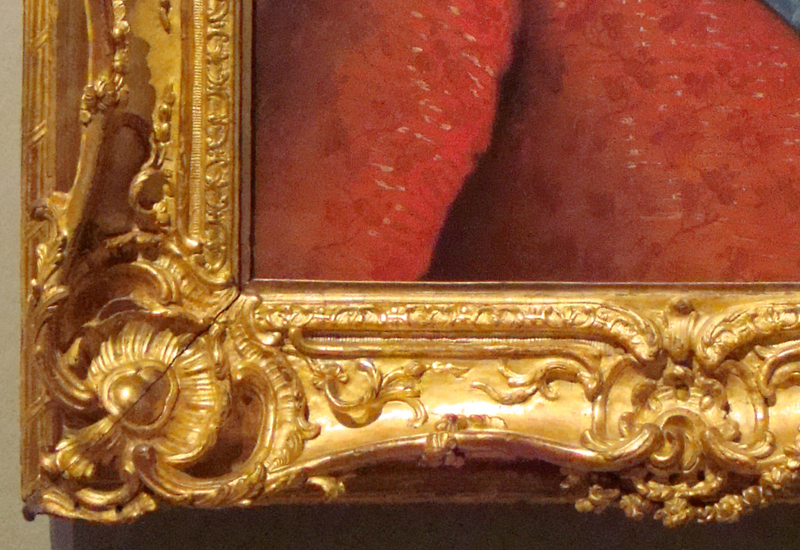 Even without the principal version of La belle chocolatière and her setting, however, there are some notable examples of Rococo frames in the exhibition. It is organized in six thematic groupings of Liotard’s work. In Rooms 3 – 5 some of the real stars of the framemakers’ art are revealed: the displays here concentrate on Liotard’s activities as a society painter and court artist for the British, French and Austrian royal families. Many of the portraits seen in these rooms are framed by elaborate examples of Rococo carving. They provide a window on a period where the framemaker’s skills and the patron’s wealth were applied equally, combining in a high point for the art of the frame. In Room 3 we find Liotard’s British society portraits – some of the best frames to be seen here are French-style Rococo models. The Portrait of Lady Anne Conolly (c.1754, Wrotham Park ; cat. no 36) has a good example; a Louis XV frame with swept top edge, a scotia featuring ornate strapwork, and shell cartouches. The ornament shows the French skill in réparure – the process of recutting the gesso layered over the carved wooden carcass to produce crisp, fresh looking details and contrasting surfaces to catch the light. 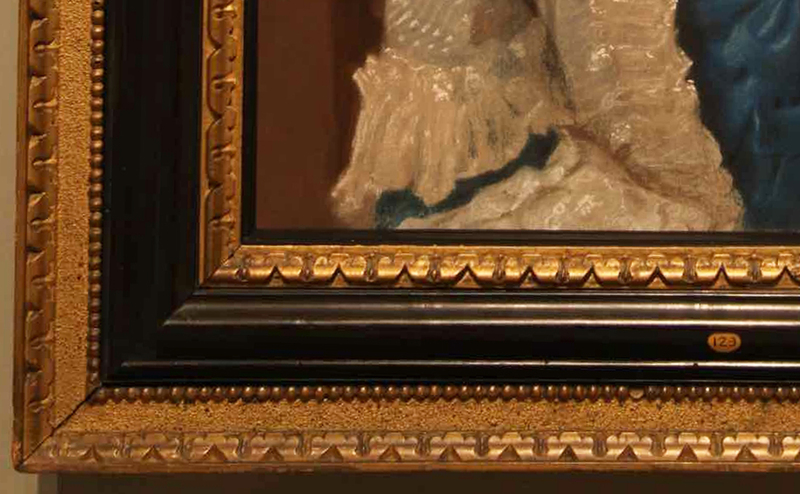 The next frame to catch my eye in this section surrounds the portrait of John Stuart, Viscount Mountstuart (cat. no 44). This pastel was executed while Lord Mountstuart was in Geneva, c.1763 (he was 19, and on the Grand Tour), as was the Rococo frame. A stunning and idiosyncratic model of a pattern to be seen on several of Liotard’s portraits, two of which feature later in the exhibition , it is also an example of the elaborate designs often associated with pastel works, such as those by Francis Cotes . The sharp detail seen in the foliate cartouches displays again the skill of recutting in the gesso, whilst the asymmetrical ornament and shaped sight-edge display the sculptural, mouvementé qualities of the French Rococo. Also of note in Room 3 is the portrait of Miss Bacon (cat. no 35). 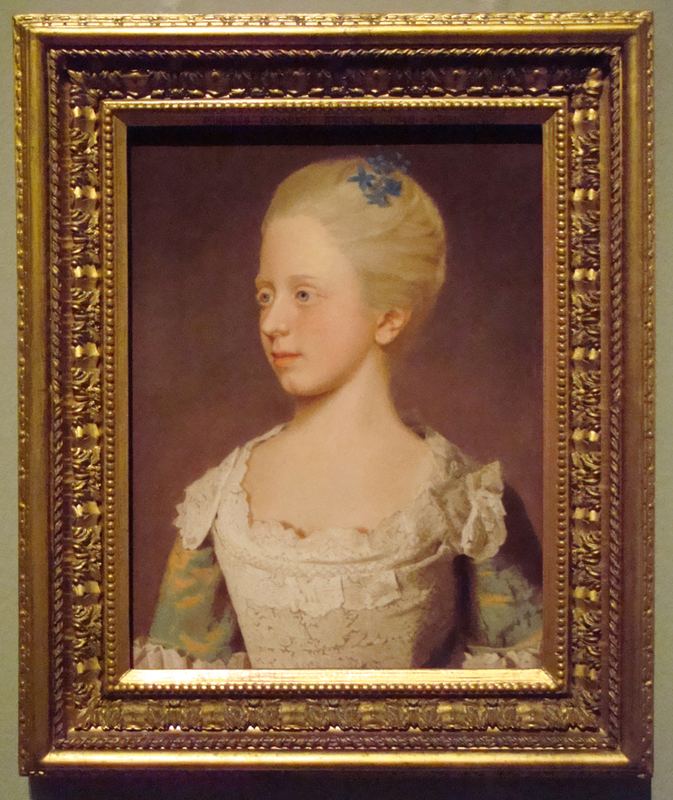 This was painted during Liotard’s first visit to England in the mid-1750s, and is framed by a beautiful example of the British Rococo style. It is a pierced design, with swept sides of flat ribbon-like S-scrolls, a hanging flame motif in the scotia, and raffle leaf corners and centres. The overall effect is so light and delicate that it seems to be floating. 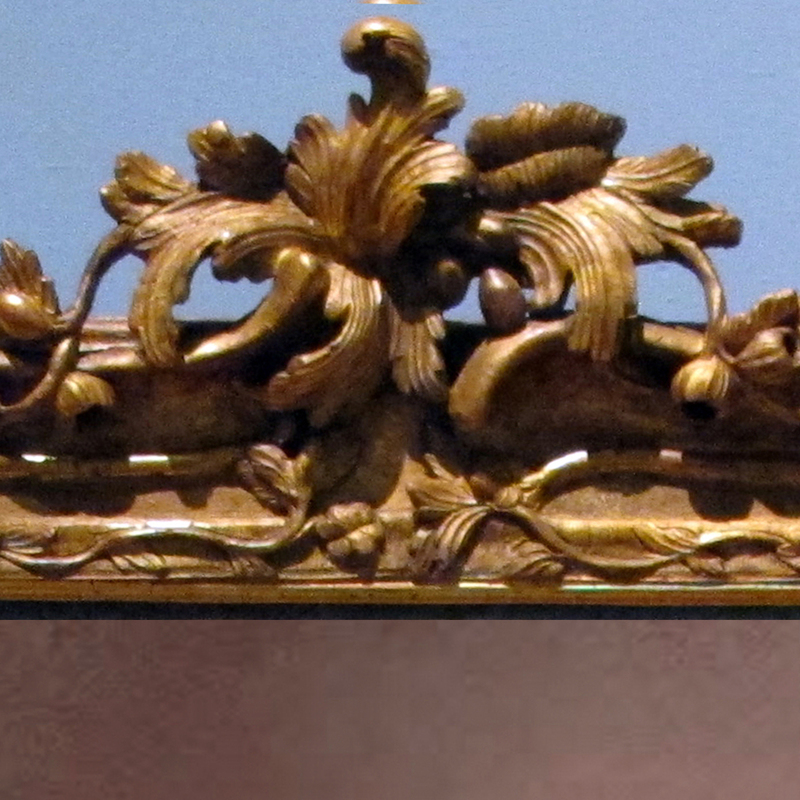 As was more common for English frames, the ornament appears to have the all the detail carved in the primary wooden rail, rather than recut in the layers of gesso, and whilst it is still of excellent quality it is perhaps not as sharp and refined as in the French models. 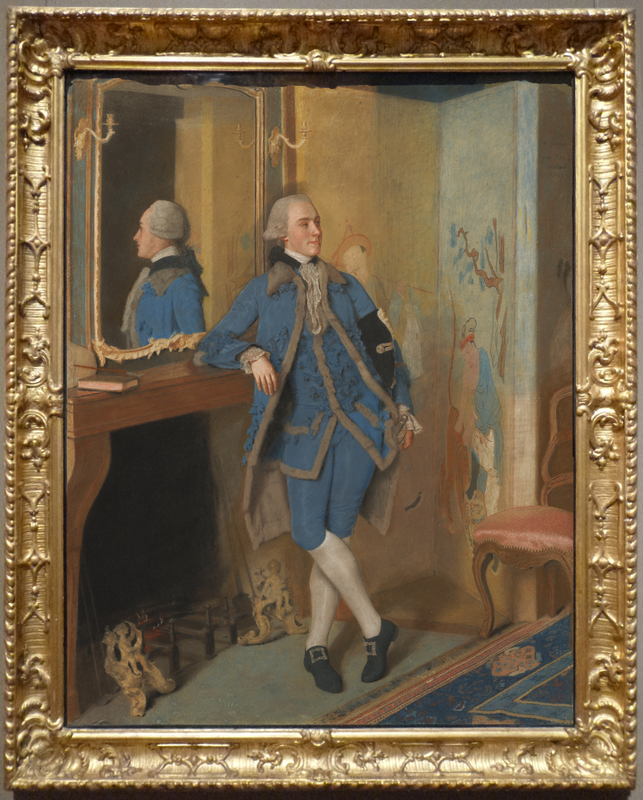 Room 4 concentrates on Liotard’s royal commissions, and offers an interesting comparison between the framing styles of the French and English courts in the mid-18th-century. The portraits of Louis XV, the Dauphin, Princess Henriette, and Princess Victoire, (all 1749/50; cat. nos 51-54 ), are set in almost identical frames which exhibit Rococo framemaking in its most developed form. The carving has incredibly fine detail, and a flowing asymmetry which makes them appear to have been poured around the painting. They are not symmetrical around their horizontal axes (i.e. the top and bottom corners differ markedly from each other): the bottom corners are pierced, and feature opposed C-scrolls with rocailles and a shell-like form containing a cabochon, whilst the top corners have radically skewed and S-scrolled rocailles which melt into the surrounding ornament in complex folds. The back contour is linear, whilst the top edge snakes upwards through fluid and asymmetric centre ornaments, and is sprigged with floral rinceaux. As you would expect, the carving and recutting of these royal frames is of the highest quality: some of the finest detail appears in the carved chains of flowers which twine around the top edge, as if growing from some luxurious floral wall hanging. We may assume that such designs would have been part of an elaborate integrated interior of carved boiseries and giltwood furniture. This is framemaking at its most sculptural, and these objects are arguably works of art in their own right – extravagant and costly, even compared with Liotard’s rates for his work. Liotard’s portraits of the English royal family (seven on exhibition, out of a total of eleven) are, in comparison, framed in the more restrained and classicizing style of the ‘Carlo Maratta’. 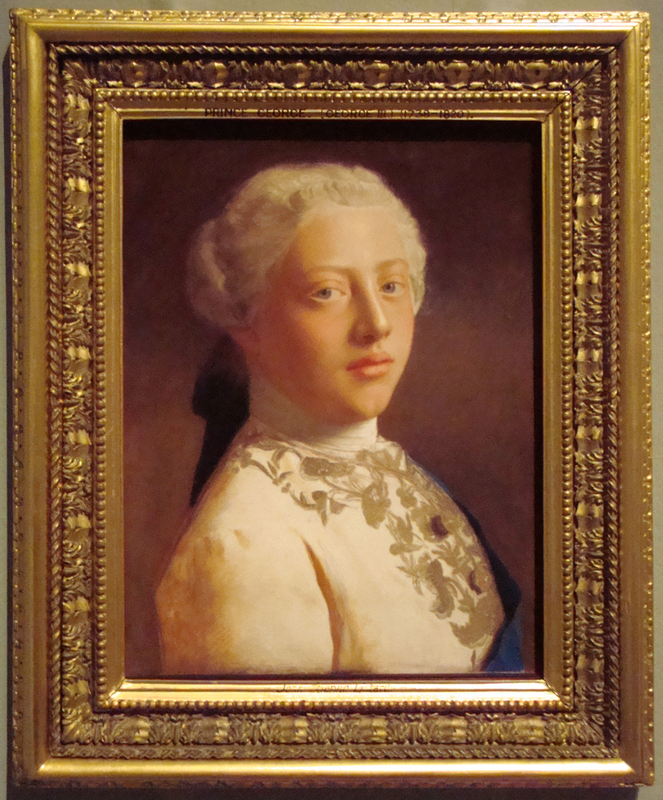 Here, the frame for the portrait of George III, George, Prince of Wales, 1754 cat. no. 29, provides an extreme, linear contrast to the flourishes of the frame on Louis XV’s portrait. The ‘Maratta’ was popular in Britain from the mid-18th century, and was also used by Francis Cotes for both his pastels and oil paintings . More formal than the sculptural Rococo style of their French counterparts, these frames are still high quality examples of 18th-century craftsmanship, with skilfully carved ribbon-&-stave and acanthus-&-shield ornaments applied in the scotia. The frames for the British Royal family were refreshingly understated, and I ventured into the next section of the exhibition ready for some more Rococo flamboyance. Room 5 doesn’t disappoint in this respect: here, the focus is on Liotard’s Continental society portraits, and the frames for the paintings of Isaac-Louis de Thellusson and his wife Julie (1760, cat. nos 66 & 67) stand out as further superb examples of the Rococo, complementing the opulence of these pendant portraits. 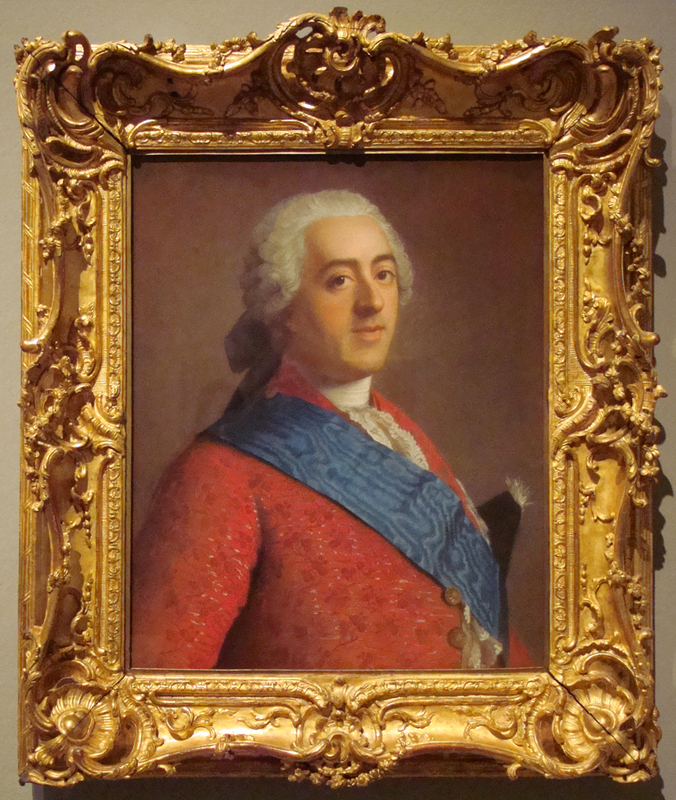 The design of both frames is extremely close both to the frame on the portrait of Lord Mounstuart, and to others such that on Liotard’s pastel of Jean-Louis Buisson-Boissier (1764, Museum of Fine Arts, Houston) . The portraits of the Thellussons and Mountstuart were painted and almost certainly framed in Geneva, although there seems to be no current evidence as to the carver responsible. In common with the free-flowing style of the Rococo frames around the French royal portraits, these wide, hollow frames have a sweeping top edge scrolling into asymmetrical ornaments. The foliate cartouches are full of movement and liveliness, culminating in a delicate fronton which dances on top of the frame and beckons the viewer to come closer. These asymmetrical patterns come from the height of the Rococo period in the mid-18th century, when the extravagance of sculptural line and plastic ornament was most fully realized, by master carvers at their most confident and liberated. As charmed as I was by the Rococo frames here, I left the exhibition admiring the function of Liotard’s frames as well as their form. 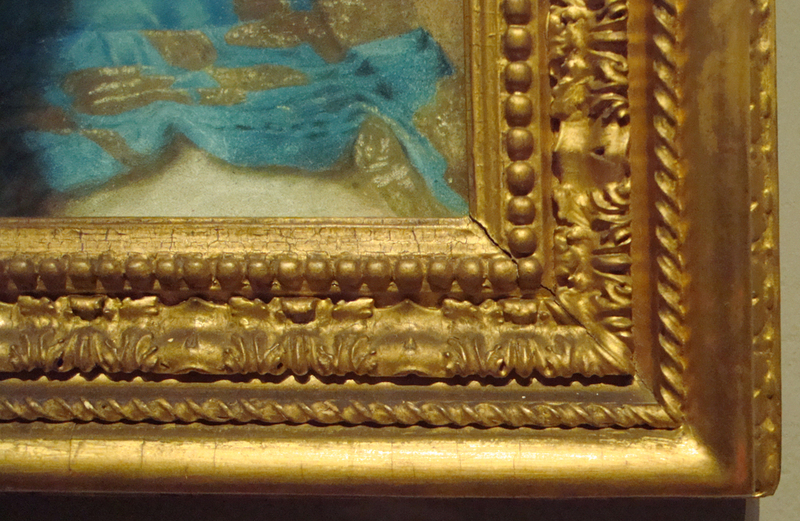 The framing was a necessity for pastel works, and as grand as many of the sculptural frames are, they were fitted to protect the pastels as well as to enhance them. 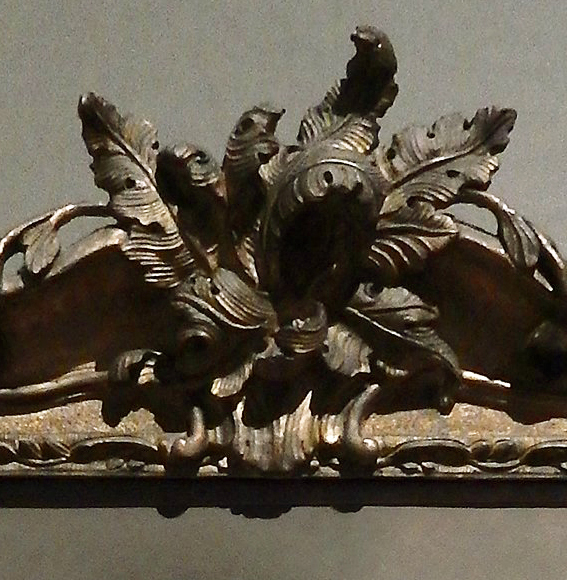 The mounting of the support was as considered and well-crafted as the carved decorative surfaces, and has contributed to the survival of many pastel frames. 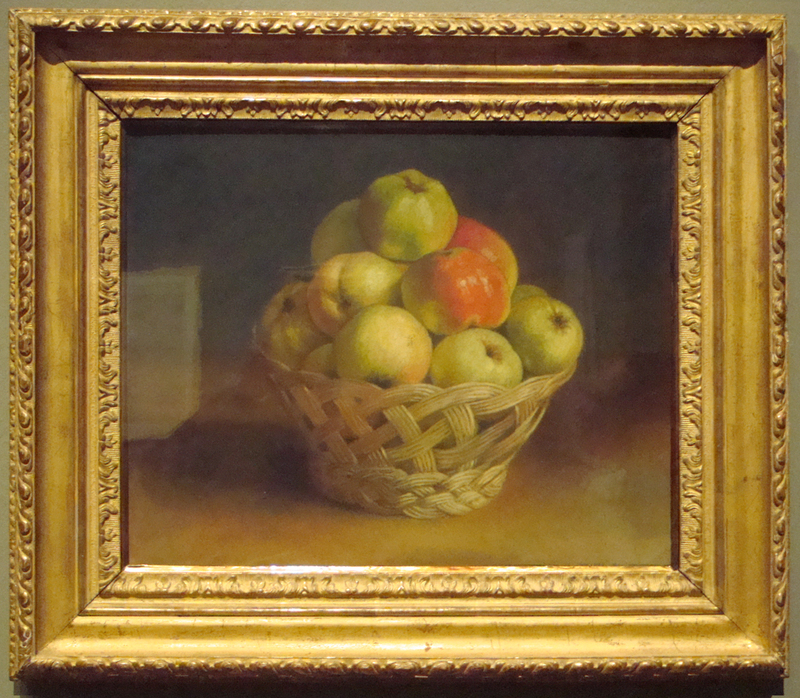 The Still-life: A basket of apples (cat. 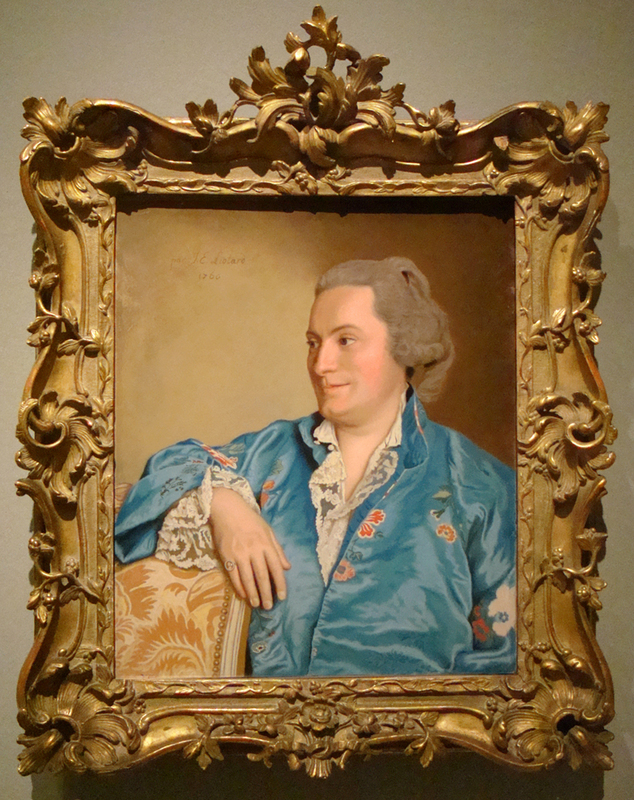 82) is one of a group of similar late works, which apparently Liotard couldn’t, or didn’t want, to sell; the very beautiful Louis XV straight-sided ogee frame seen here may possibly be original to the painting. What may be an original glazing slip also appears to have been retained, part of a framing technique that has changed little over the centuries. It is known that in addition to glazing his pastels Liotard also sealed the back with a protective board, and that in some cases he signed and dated this board . Pastels may sometimes be overlooked, in comparison with oil painting; this exhibition not only gives us a large and varied selection from the work of a great artist, but is intensely interesting from the perspective of the frames. It upholds, at least to some extent, the idea that works in pastel may be looked at to reveal the taste and techniques of fashionable framing styles from a particular era. 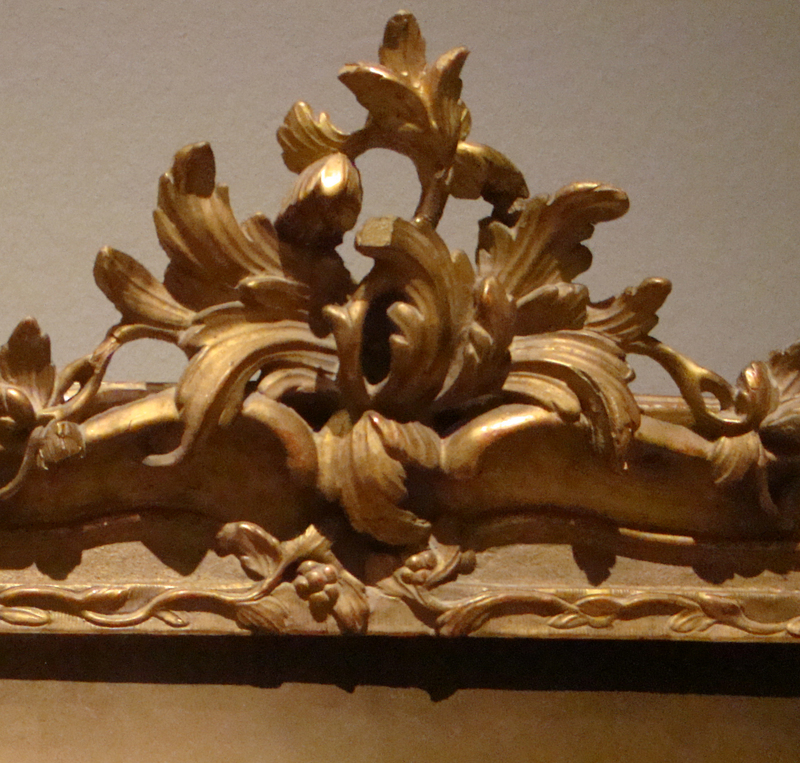 The free-flowing sculptural frames in flamboyant Rococo style achieve some high points in the framemakers’ art. This is an unmissable exhibition for anyone interested in spectacular frames. Even for those who may not hitherto have thought much about frames, or for those who are so bowled over by Liotard’s skill that they focus on the works alone, it would be difficult not to be struck by the quality of the settings for some of his pastels. The exhibition at the Royal Academy gives the opportunity to see examples from three main groups of these, which have been assembled – in one case, for perhaps the first time – and to reflect on other works framed in similar style. Two of these groups are the portraits of the British and French Royal families respectively; and it will not be surprising that, while records and invoices for frames hardly ever survive, the one place that they are most likely to overcome the hazards of ephemerality is in the archives of royalty – even if in a very fragmentary state. 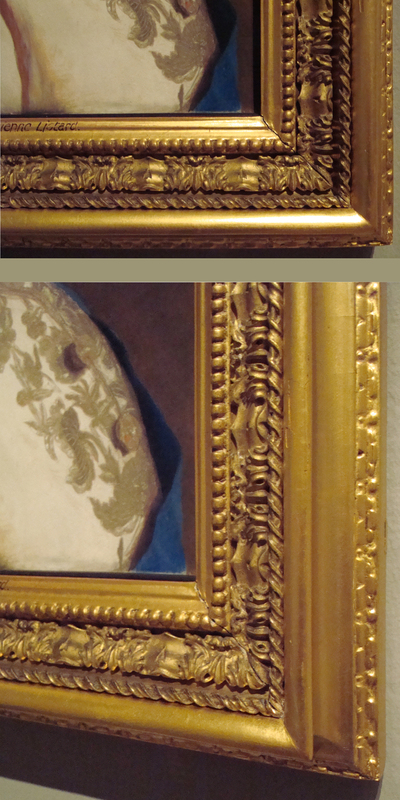 The frames on the portraits of the British Royal family, which were commissioned in 1753 and completed probably in 1754, are the more conventional of the three groups considered here, as they are in the same ‘Carlo Maratta’ pattern – two slightly larger ones for the pastels of Frederick, Prince of Wales (the dead son of George II) and his wife, Augusta, and nine rather smaller for their children. But although they may stand out from the more flamboyant Rococo patterns, and although (as the catalogue indicates ) they are the settings for intimate paintings to be hung in the private apartments, these are not penny-pinching solutions to a framing en masse. The pattern is a ‘full Carlo’ with five orders of ornament: a stylized leaf back edge, a spiral ribbon moulding, an acanthus-&-shield (carved separately, like the ribbon, and applied in the scotia), and beading at the sight edge. 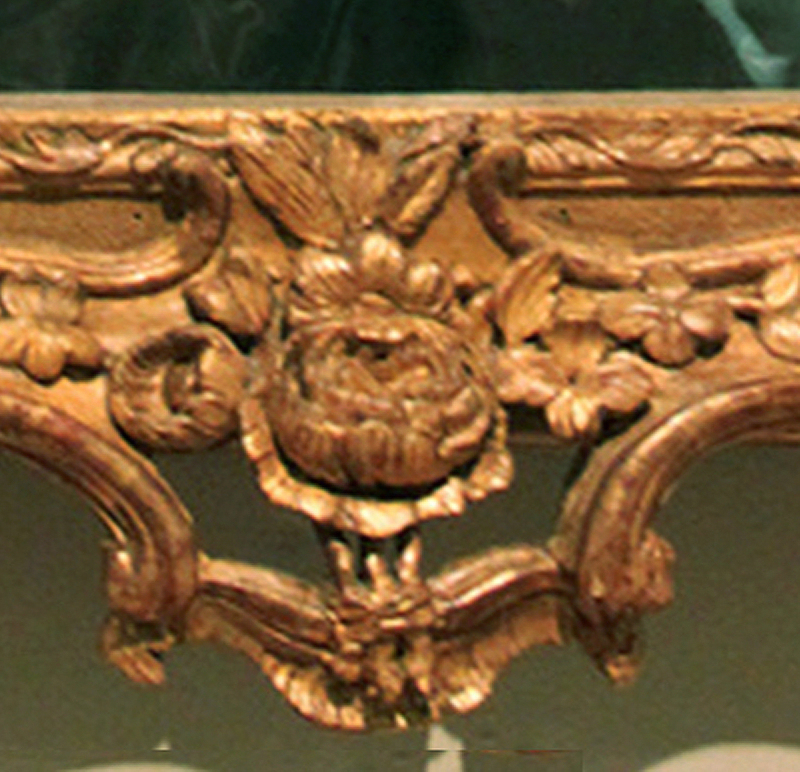 Although time and regilding have softened the crispness of the original carving, the skilful craftsmanship and the refinement of design (notice how the corners abut so beautifully in each order of decoration) demonstrate that the framemaker would have been one of the few whose expertise was chosen to serve the Crown regularly. William Hauptman notes in the exhibition catalogue that Liotard asked 18 guineas for each pastel, and 20 guineas for each of the three miniatures. We see the miniatures mentioned on the receipt here, amounting to 60 guineas; the four pastels, if they cost 18 guineas each, would come to 72 guineas, meaning that their frames and glazing (bordures & glaces) would be 36 guineas – or 9 guineas each. This seems rather strange, if the last item on the receipt – the large frame with glass for the portrait of the deceased prince (which was slightly larger than the portraits of his children) – cost only 5-and-a-half guineas; as strange as the miniatures costing so much more than the much larger pastels. It seems more likely that the four pastel frames cost about 5 guineas each, or 20 in total, making the pastels themselves 88 guineas, or 22 each. 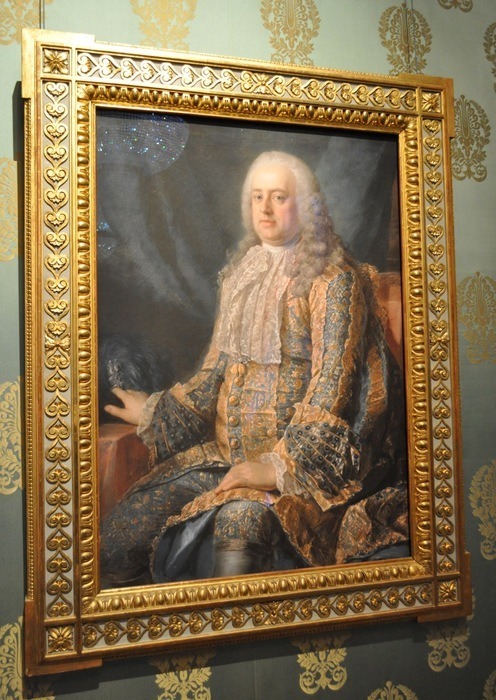 Whatever the true proportions of this bill, it is at least clear that Liotard (as so many artists) arranged the framing and glazing himself, invoicing it to the client along with his paintings, and that the frames were probably comparatively expensive in relation to the portraits – around or just under a quarter of the cost. There are at least six candidates for their manufacture amongst the London craftsmen of the right period, who are recorded as working for the Crown; and interestingly four of these are of Huguenot parentage or extraction. It maybe that Liotard, himself the child of French Huguenots, might have gravitated to the Huguenot community in London because it was similar to what he had known in Geneva, or that he simply felt more confident dealing with a French-speaking framemaker when attending to technical matters . The most likely of these framemakers are Joseph Duffour (fl.1730-d.1776), who worked for Frederick, Prince of Wales (the ‘defunct Prince’ who features in Liotard’s receipt, above); Benjamin Goodison (c.1700-67), who likewise worked for the Prince until the latter’s death in 1751; Gerrard Howard (1709-post 1745), who was the King’s framemaker from 1727 until 1752, but who may have ceased working altogether at that point, just before Liotard’s frames were made in 1754; Paul Petit (fl.1722-1757 or later), who produced particularly opulent frames for Frederick, Prince of Wales, but also sold him two ‘Maratta’ frames in 1749 ; and René Stone, who followed Gerrard Howard as the King’s framemaker in 1752 . Even more likely, perhaps, is another Huguenot, Isaac Gosset, who worked for Hogarth, Allan, Ramsay, William Hoare and Gainsborough, as Jacob Simon points out , and seems also to have been on terms of friendship with them. 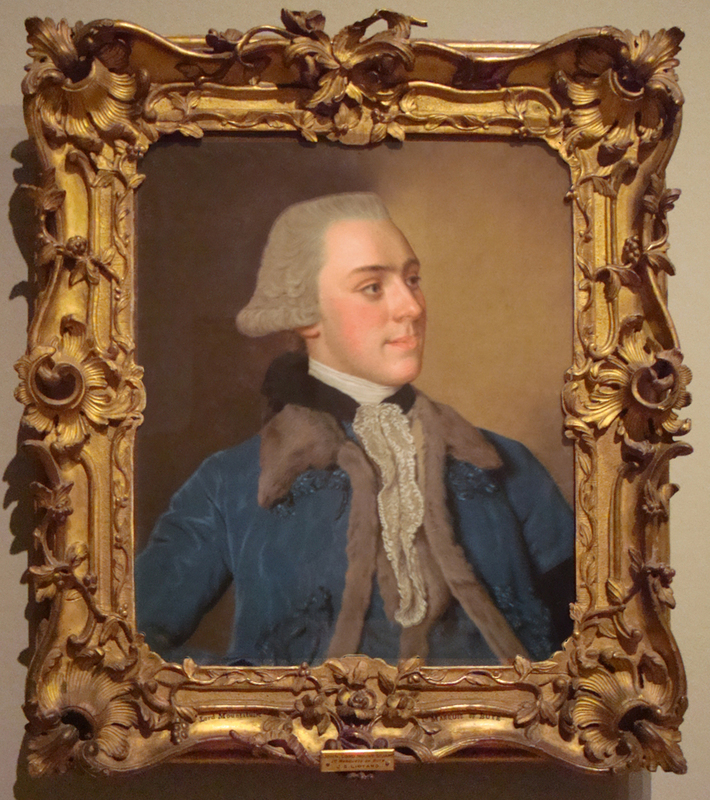 Gosset, moreover, was actually painted by Liotard , and was an accomplished carver of ‘Maratta’ frames (these formed the staple structure of the frames he later produced for Allan Ramsay’s state portraits of George III ). The maker of the frames for the portraits of the French Royal family is less mysterious, since the accounts related to his work still survive . Eight at least of the frames for this series of pastel portraits were carved in Parma in northern Italy, which at that time was – like France – under the aegis of a wing of the Bourbons. Louis XV’s eldest daughter, Princess Louis-Elisabeth, was married to Philip, third son of Philip V of Spain, the couple together becoming Duke and Duchess of Parma in 1748 and founding the House of Bourbon-Parma. 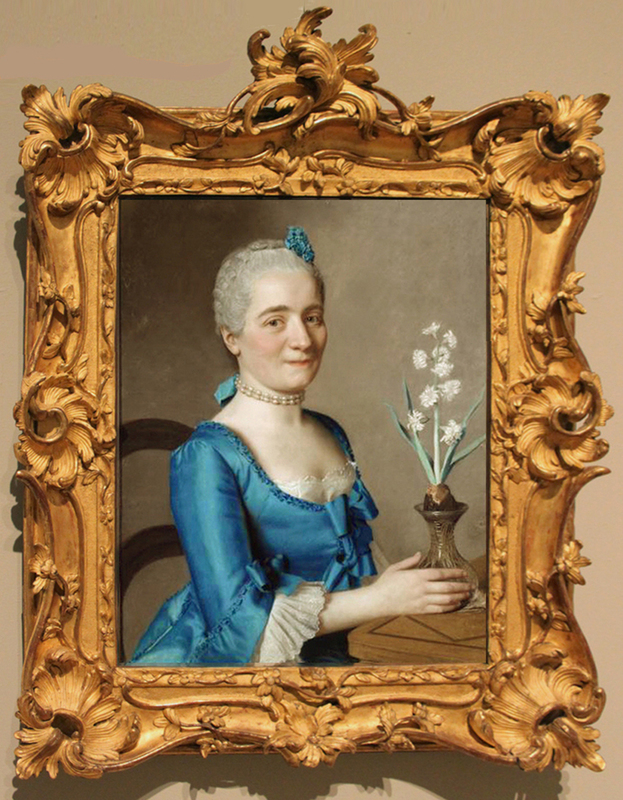 The pastels were painted in 1749 and 1750, and were presumably the versions exhibited in Paris in 1751 and again in 1752 (rather than the copies Liotard made for himself). They must therefore have been taken to Parma by the Duchess and her husband between 1752 and 1754, when the French woodcarver, Marc Vibert, mentions the frames he had made for them in his accounts for the latter year . ‘huit années qu’il a employées au service de S.A.R’ – the eight years he had worked for their Royal highnesses . ‘riches ornées de guirlandes de fleurs autours des traverses et des pieds’ – richly ornamented with garlands of flowers twined about the legs and cross-pieces. 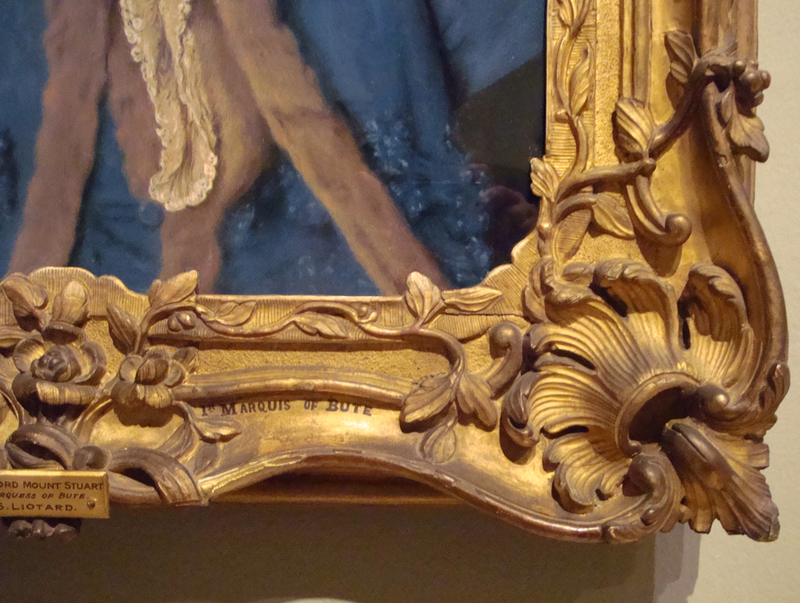 Garlands of flowers looped around and through the S-scrolls of the rails and the asymmetric rocailles are a particularly refined and beautiful feature of these frames, as well. The pieces which Vibert produced in Parma would have been based upon, or related to, the furniture which the Duchess of Parma, Louise-Elisabeth, took out to Italy with her after a year’s visit to her father’s court in 1749 – for example, an armchair in the collection of the Metropolitan Museum by Nicolas-Quinibert Foliot, supposed to have been in this first shipment of stuff. 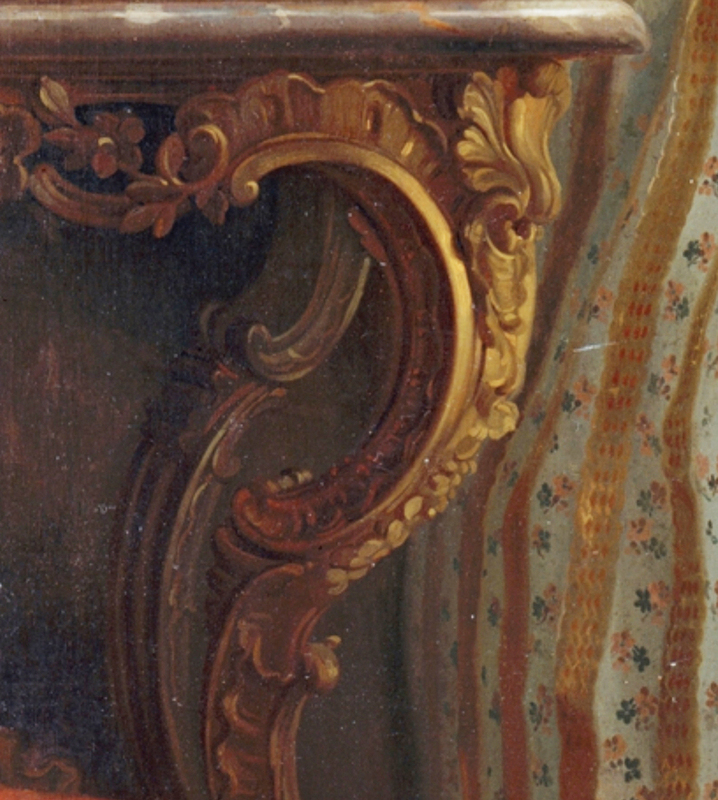 This chair (or one of the same set) can be seen in Laurent Pécheux’s portrait of Maria Luisa, one of the Duchess’s daughters, painted in 1765 and also in the Metropolitan Museum (detail below). 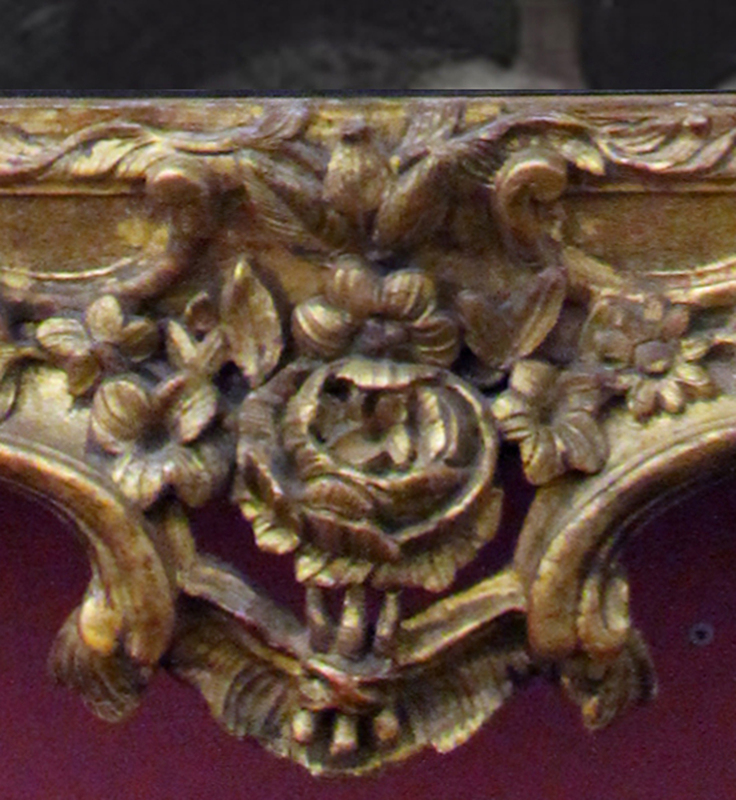 It is suggested in the Bulletin of the Met for January 1966 that the Rococo console table in the same portrait (above) may be the work of Vibert or one of his colleagues. Vibert’s work, however, seems – by the evidence of his frames – to have been on another level of imaginative achievement from this table, and to possess a variety and elegance which places it at a peak of Rococo design. This appears in the exceptional plasticity of the forms, and the asymmetry of the corners and centres: the frames are also asymmetrical about the vertical axes, so that the upper corners are markedly different from the lower. The back edge is decorated with bound fasces; the upper corners are harp-shaped, pierced, with rocailles and foliate clasps holding skewed lobes; the lower corners have outer rocailles and pierced opposed C-scrolls containing further rocailles which centre on pear-shaped cabochons. The lateral centres spring in rocaille clasps diagonally from the sight edge in a swirl of foliate and rocaille C-scrolls, twined with garlands of florets; the top and bottom centres are based on large and small circular rocailles, the top pierced and finished with a leafy spray. Pendant buds with undercut stems and fernlike leaves scatter the hollow or scotia of the frame, and the inner mouldings are ornamented by hatching  and cross-hatching, cut in the gesso, with bérainesque C-scrolls and buds at the sight edge. The play of large- and small- scale ornament is rich and complex without being overpowering, and the overall effect is notable for its sense of dynamism and sweeping movement, which heightens the inherent animation of Liotard’s work. 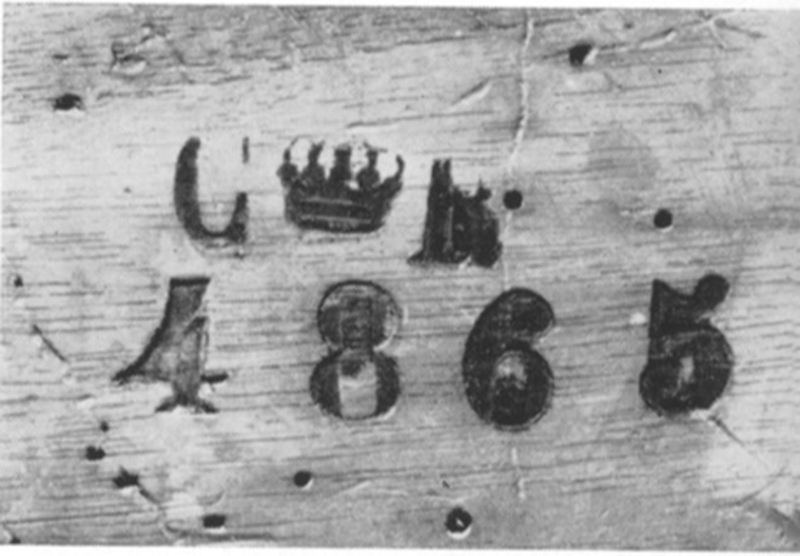 Note, incidenatlly, how the lamination of the crest has been revealed by the separation of the wooden pieces over time. Memoire des ouvrages que jay fait pour leurs A.R. Perhaps further information may surface as to Vibert’s earlier life and training, before his move to Parma, and also some reason for the strange disparity of price paid him for the two frames in the second paragraph of the account, for which he received 106 livres each, rather than the 204 livres of the other six frames. Liotard himself received 1920 livres together for the last two portraits he delivered, or 960 each . Vibert’s other work for the Duke and Duchess is difficult to identify; the frames of pier-glasses and other looking-glasses from the various palaces were removed, cut down or adapted, and scattered to other locations . Gonzalez-Palacios suggests that a suite of chairs, armchairs and stools now kept in the Royal palaces of Genoa and Turin might be by Vibert’s hand, based on the flower garlands with which they are decorated. 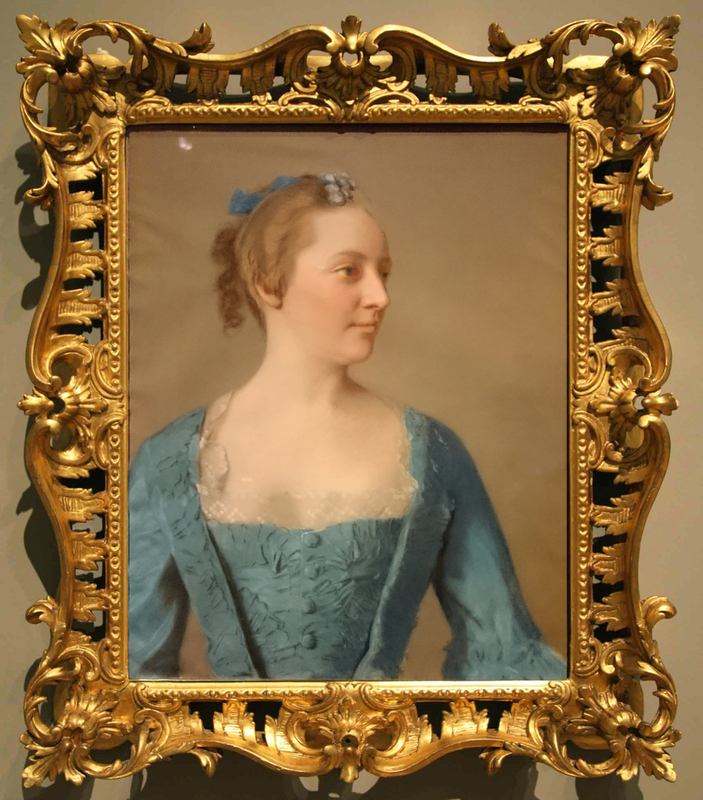 The craftsman responsible for the third important group of Liotard’s frames is sadly still a complete mystery. 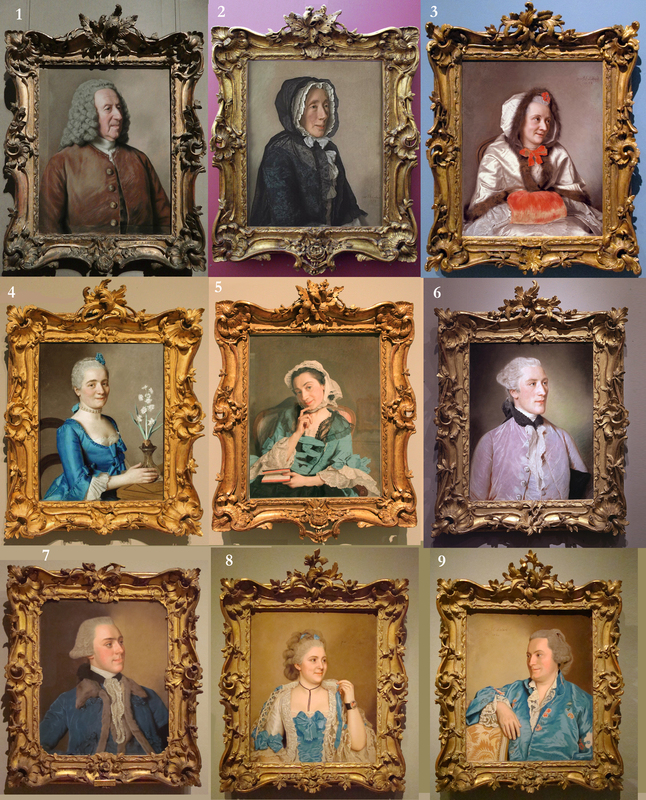 This group comprises the frames carved for the portraits of non-royal but socially important sitters produced in Geneva, of which there are at least nine. These include three portraits in the Royal Academy exhibition (no 7: Viscount Mounstuart, c.1763, private collection; nos 8 & 9: Isaac-Louis de Thellusson and Madame de Thellusson, both 1760, both Museum Oskar Reinhart, Winterthur); three portraits which remain in Geneva, in the Musée d’art et d’histoire (no 3: Madame François Tronchin: ‘Dressed for the cold’, 1758 , no 4: La femme à la jacinthe, 1750-59 , and no 5 : Madame La Live d’Epiney, c.1759) ; there are two other members of the Tronchin family (no 1 : Jean Tronchin, 1759, The Getty Museum, Los Angeles, and his wife, no 2 : Anne Tronchin, Musée du Louvre); and the ninth work is no 6 : the Portrait of Jean-Louis Buisson-Boissier, 1764, Museum of Fine Arts, Houston. 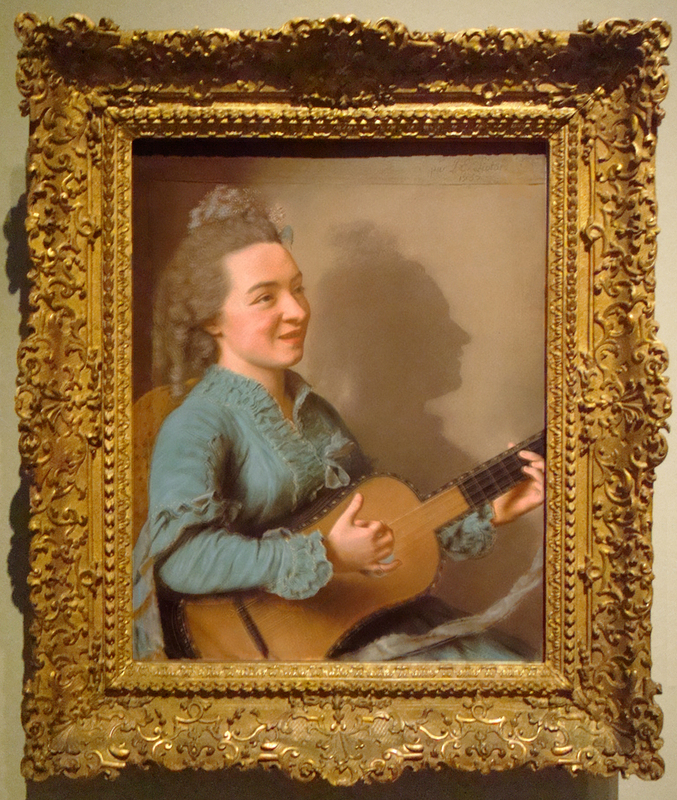 In addition, there is a fourth portrait of a member of the Tronchin family, Marthe-Marie Tronchin, 1758, Art Institute of Chicago; however, the frame of this work is different enough from the other nine to raise the possibility that it was made by another hand, after the example of the main group. Even in Geneva there seems to be no clue to the identity of the carver and gilder who produced these strikingly beautiful frames, although – given Liotard’s own Huguenot background, and that a significant number of the framemakers he is most likely to have patronized in London were also of Huguenot extraction – it seems logical to look for the carver of the Genevan frames amongst the Huguenot population there. This possibility is enhanced by the fact that, as for the sitters, the Tronchin family was also of French Huguenot extraction , as were the de Thellussons , and that just as these two families were connected, so the family of J-L Buisson-Boissier had intermarried with the Tronchins in at least two generations. 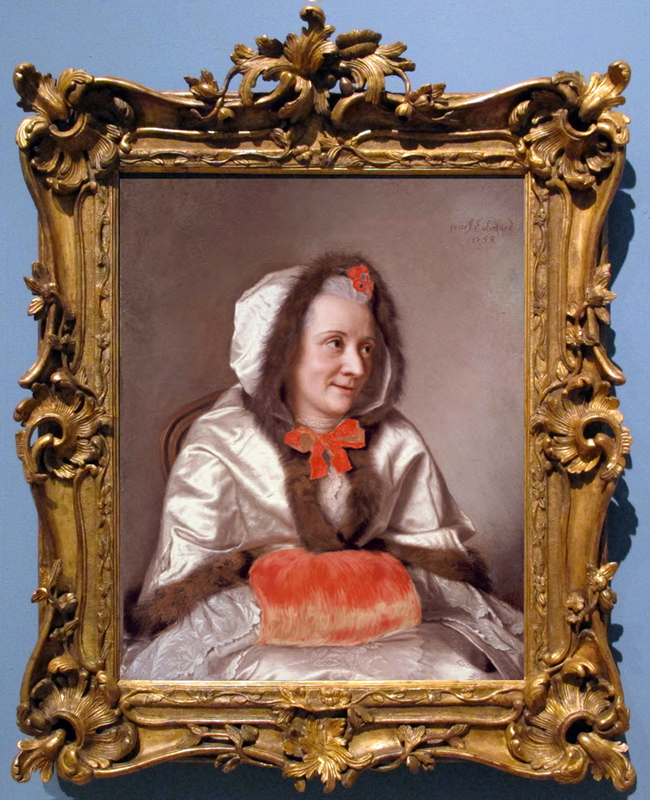 Mme d’Epiney’s connection with this closely-integrated circle of Swiss society was Théodore Tronchin, the doctor whom she had come to Geneva to consult, and for whom she commissioned her portrait by Liotard as a gift in gratitude. The ties amongst this group of portraits are thus so many that it seems more than possible that the Lady with a jonquil is also a scion of one of these houses; whilst the Pictets, through whom the portrait of Lord Mounstuart was commissioned, were connected to the Buissons by marriage, as well as to the de Thellussons through the business of banking. The work of the unknown carver is as striking and beautifully composed as Vibert’s, and perhaps even more energetically asymmetric and playful. 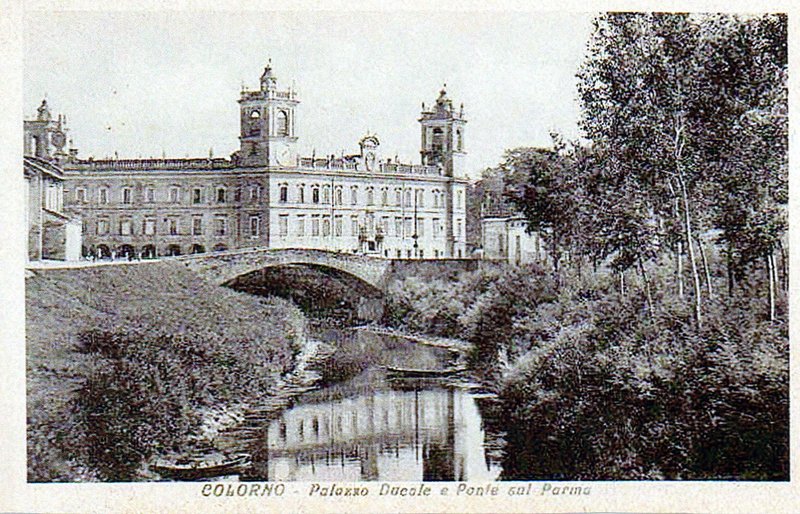 It strays further than the frames of the French royal family’s portraits into the regions of le genre pittoresque, since the centres and corners (although much more alike within themselves than in the latter case) are wilder, more swirling and dynamic even than those on the frames for Colorno, Parma. The nine Genevese frames shown together as a homogenous group illustrate this spontaneous spirit in all its free-hand diversity, as can be seen (for instance) in the different crests. These have suffered in some cases, the delicacy of the flame-like leaves leaving them open to damage – for example, the top of Mme de Thellusson’s frame has lost individual leaves, whilst almost the whole of the top of Viscount Mounstuart’s crest has been shorn off – possibly along the lines of lamination. 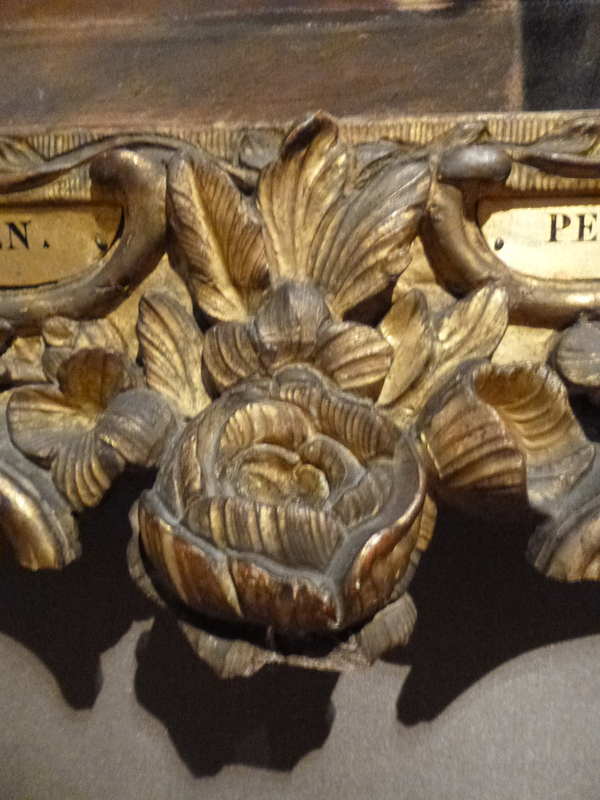 This is true of the bottom centre cartouches, as well; these are of three types: a swirling leaf motif, related to the main corners and lateral centres, on the frames of Mme François Tronchin, La femme à la jacinthe, and J-L Buisson-Boissier; roses on those of Jean Tronchin and his wife, on Mme d’Epiney, and the two de Thellussons, with pendant pierced rocailles (broken off from the frames of the two latter and of Jean Tronchin); and a spray of smaller roses for Viscount Mounstuart, which may not have had the same pendant ornament. 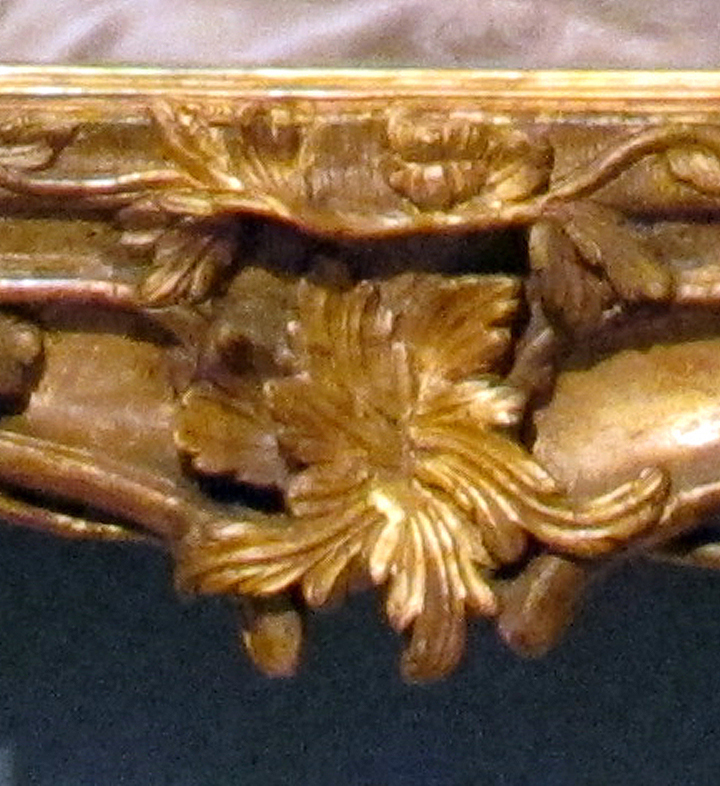 The other significant different within the group of nine frames is in that of Lord Mounstuart – the only one to have a shaped sight edge, and (whilst all the frames have a meandering vine at the sight edge, some of them even allowing it to wander from this strict border across the width of the rail), it is the only frame where the leaves themselves, as well as the ground of the centres & corners, stray onto the field of the picture. This freedom of detail within what is evidently a closely related group of frames from the same hand is the mark of a craftsman sufficiently accomplished and confident not to have to reproduce exactly the same pattern with dogged accuracy each time; a maître sculpteur who plays with ornament and motif to create a sense of vibrancy and interest even in the smaller groups of frames intended to hang together. Jean-Etienne Liotard, Portrait of John, Lord Mountstuart, later 4th Earl and 1st Marquess of Bute, 1763, pastel on parchment, 45 1/4 x 35 1/2 in. (114.9 x 90.2 cm), The J.Paul Getty Museum, Los Angeles [not in RA exh]. 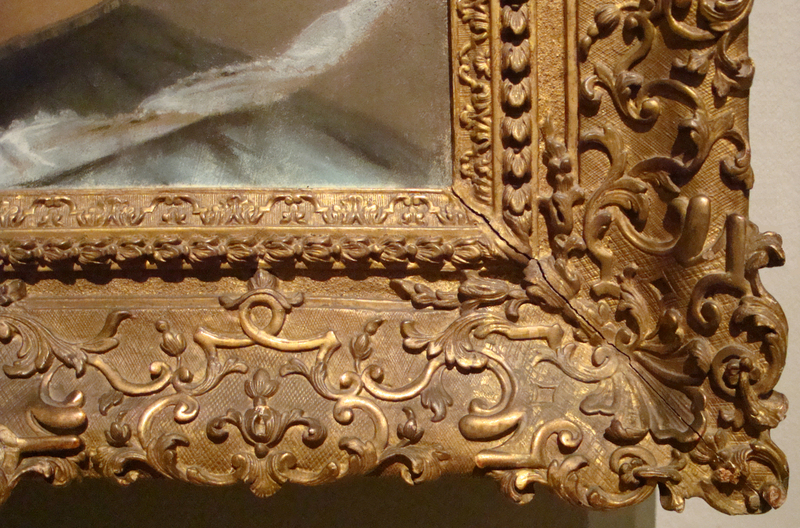 It would be satisfying to be able to resolve not only the identity of the carver of these frames, but the relationship (or otherwise) to the group of Genevan frames of that on the full-length pastel of Lord Mountstuart in the Getty Museum. 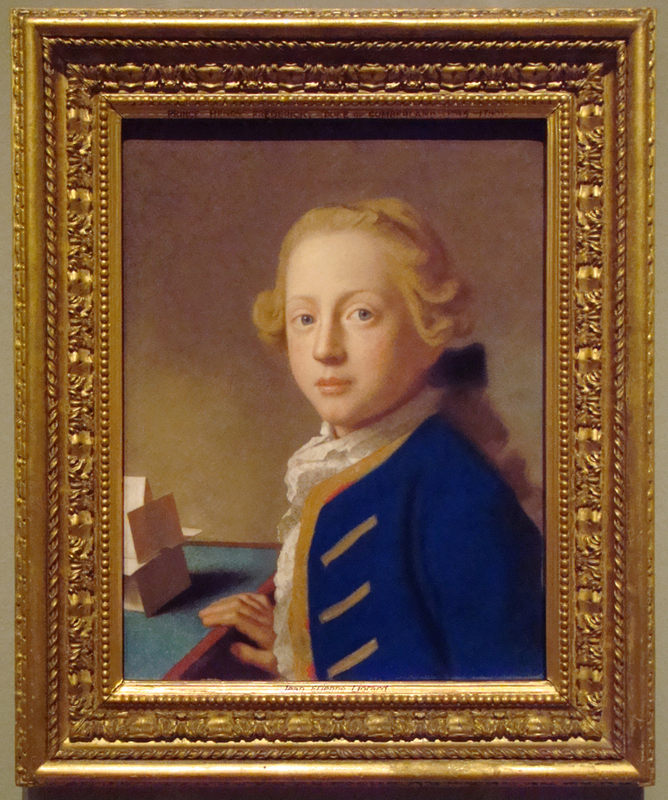 This was painted by Liotard very close in time to the portrait bust of the same sitter considered above, and the latter reproduces on a partial scale the head and shoulders in the full-length portrait, as well as the identical costume. 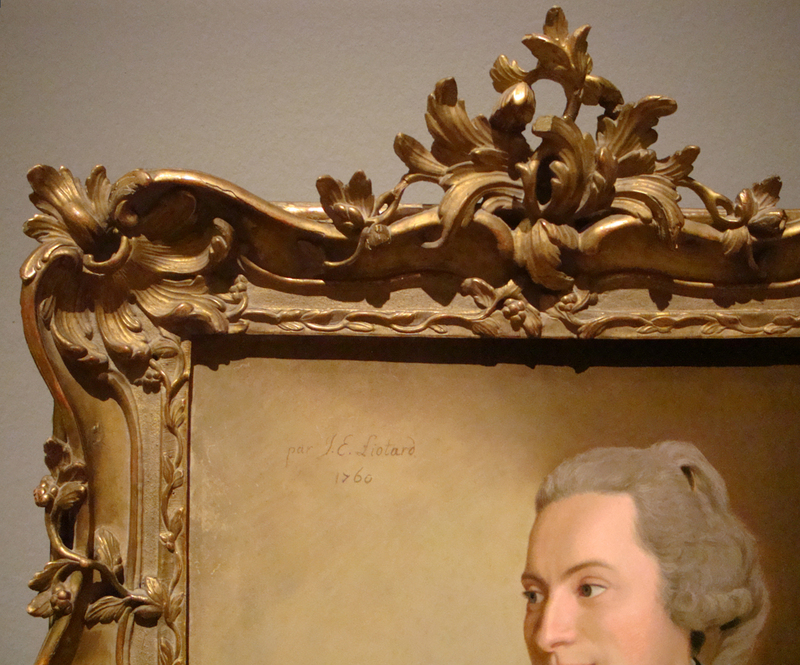 The frame of the full-length portrait is, however, as can be seen, entirely different in structure and ornament from the Rococo frame on the bust of the sitter. This pastel (above) was that for which the sitter’s father gave twice the agreed price because of his pleasure in the result, so that framing it as richly as he desired would hardly have been a consideration. 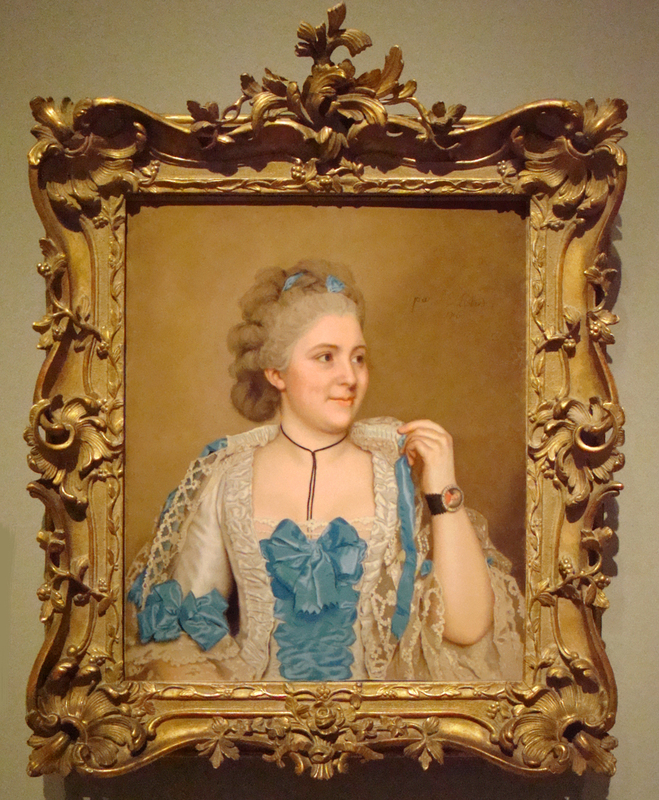 The fact that the smaller portrait has the more sculptural frame is almost certainly due to the artist; since all the Genevan pastels with related swept Rococo settings are alike in being more or less waist-length, in having a neutral background , and in keeping accessories to a minimum – completely the opposite, in fact of the full-length of Mountstuart – and since Liotard seems to have been involved, like most 18th century artists, in arranging frames for his clients, it appears most probable that it was he who ordered the more flamboyant frame for the smaller pastel, and the simpler frame for the more elaborate composition. Did he go to the same framemaker for both? The ornament and treatment seem so different in the two designs – and artists did patronize more than one framemaker at once. The full-length portrait was only sold out of the Mountstuart family in 1993, and there seems to be no reason for Lord Bute to have reframed it. 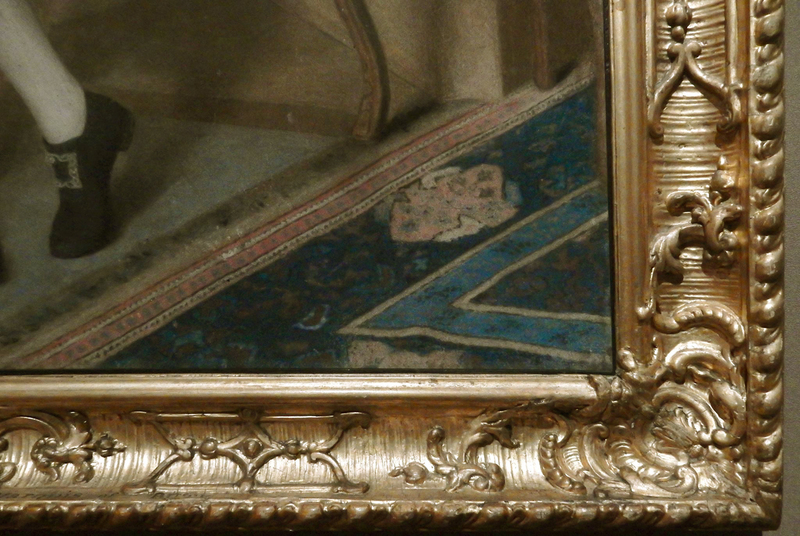 There are no makers’ marks or labels on the back, and the lack of any connection between the two frames may continue to remain a riddle. Other frames to be found on works by Liotard are disparate and, considered en masse, rather eccentric, providing a panaoramic view of the choices considered suitable at various times for his pastels, from the successful to the disastrous. The paired portraits of David Garrick and his wife are at the same time very striking in themselves, interesting as a solution to aggrandizing a pattern, and totally inappropriate – especially to the porcelain clarity of Mrs Garrick’s likeness. They are a variation on the theme of the so-called ‘Hogarth’ frame, a pattern with 18th century roots, but which cannot be connected either to the artist Willian Hogarth, or the 19th century printseller and framemaker, Joseph Hogarth. 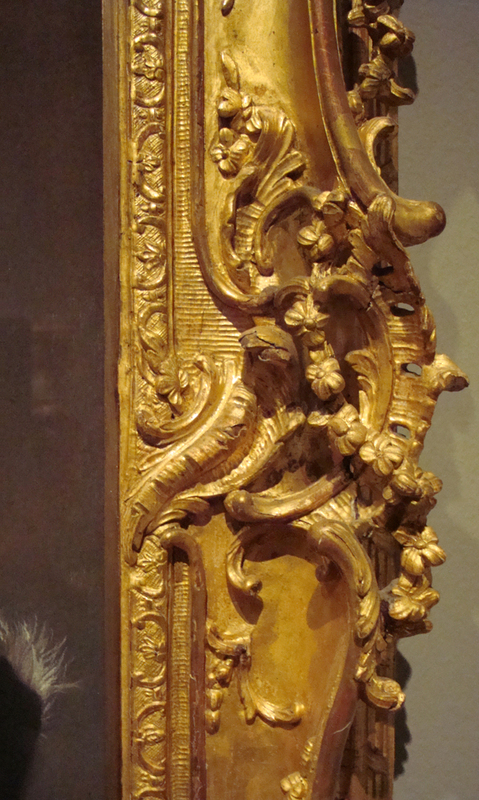 The usual structure of a ‘Hogarth’ frame, used in smaller versions for prints and engravings, has a shaped complex moulding of ebonized or stained and polished fruitwood with opposed concave and convex surfaces, a gilded ornamental moulding at the back edge, a sanded frieze, and a gilded ornament at the sight. 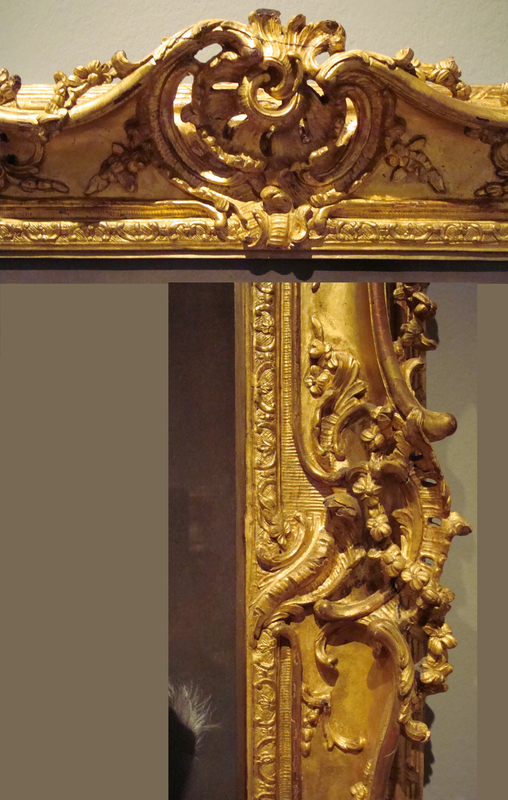 The Garrick frames turn this structure inside out, having a gilt stylized acanthus-&-dart at the back, a sanded frieze, beading, a shaped black bolection moulding, and another acanthus-&-dart at the sight. It is a design which would look extremely striking on, say, an Allan Ramsay portrait of an hussar in a scarlet uniform, but overwhelms the two actors, who look rather wistfully towards Viscount Mounstuart in his Genevan Rococo frame. Other styles include the related Palladian – which was still holding out against the Rococo, more than a quarter of a century after both were born, when Liotard came to London in 1753. His portrait of James Nelthorpe (1738, Holburne Museum, Bath; cat. no 11) has a Palladian frame, as does his pastel of Henry Fox, 1st Lord Holland (not in RA exh; Lowell Libson Ltd). 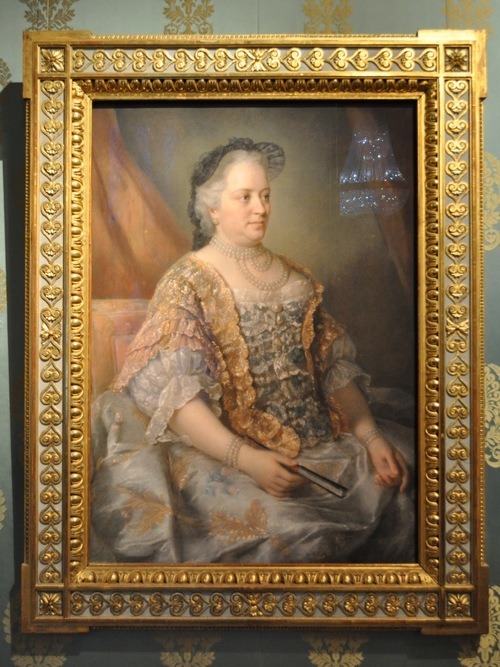 The Albertina in Vienna provides some of the more particularly outré patterns, on the portraits of the Empress Maria Theresa and her husband, the HRE Francis I, given even greater oomph when united with their crowned pediments [neither is in the RA exh.]. The Schönbrunn Palace, Vienna, is responsible for some thoroughly hideous, cheap and rackety frames on, for example, the beautiful L’Ecriture, 1752, cat. no 76; whilst William Ponsonby, Viscount Duncannon and his wife (1738, Stansted Park, cat. nos 12 & 13) are in nice but far too early 17th century ‘Lely’ or panel frames. The portraits of M. and Mme Favart, however (both 1757; respectively private collection and Museum Oskar Reinhart, Winterthur), although also in settings which are both too early for their date and rather too wide, have at least settled in examples of Louis XIV frames which are notable for beautiful craftsmanship in their own right, and thus provide a more positive note to bring this brief survey to a close. Look at this detail, below; the refinement of modelling, the subtle sheen of the burnished ornaments, the recutting of the gesso with leaf veins, and the varied texturing of the ground with different cross-hatching and diapering. These Liotards, although sundered from their original frames, haven’t been altogether unhappy in the new homes they have acquired. With grateful thanks to Jon Slight for his review of the exhibition; Susana Vasquez at the Royal Academy; Paul Mitchell and Steve Shriver for their terrific photos; and the owners of the various Liotards who kindly allowed their pictures to be photographed, and the photos to be used in this article. These belong to a set of ten portraits of the Bourbon family – Louis XV, his heir and wife (the Dauphine), six of his daughters, and one granddaughter (Isabelle de Bourbon-Parme), of which eight portraits are now in Turin. Copies and miniature copies of these were also made (Christopher Baker et al., Jean-Etienne Liotard 1702-1789, exh. cat., Scottish National Gallery & Royal Academy, p.202). Recorded in Oliver Millar, The Tudor, Stuart and early Georgian pictures in the collection of Her Majesty the Queen, 1963, entry for Liotard; with thanks for the reference to Josh Dales. Liotard’s wife, Marie Fargues, who he married in 1756 when he was 54 and she was 28, was also the child of a French Huguenot, a merchant in Amsterdam. There are two paintings by Jan Brueghel the Elder in the Royal Collection which may be the paintings meant: both bought by Frederick, Prince of Wales before 1750, they are A Flemish fair at Hampton Court, and Adam & Eve in the garden of Eden, both in the same ‘Maratta’ frame enriched with corners. The carving of these, however, is extremely fine, and the runs of ornament along the rails are more opulent and refined than those of the Liotards in the Royal Collection. The names of all these craftsmen are taken from Jacob Simon’s meticulously and incomparably detailed Directory of British Picture Framemakers, 1600-1950, where fuller histories for each of them may be found. Other chronologically-possible candidates as Liotard’s supplier include John Adair, Sefferin Alken, Jean-Antoine Cuenot, Abraham Dallain, Jacob Gosset, and Charles Mathyson or Mattison. I am particularly indebted for information on the framing of the French Royal portraits to Neil Jeffares, who has very generously shared the relevant pages of Gonzalez-Palacios. Liotard painted Louis XV, his heir & wife – the Dauphin & Dauphine, his eight daughters, and one granddaughter. The two male portraits and six of the daughters’ are now in Turin, and four pictures in total came to the exhibition at the Royal Academy, of which only one framed portrait was allowed to be photographed. Alvar Gonzalez-Palacios, I mobili italiani, 1996, Appendices, p.359. Marc Vibert does not appear in Henri Vial, Adrien Marcel & André Girodie, Les artistes décorateurs du bois, 1874; there is a prolific family of Viberts (sculpteurs-doreurs) in Grenoble throughout the 18th century, and a Jean-Baptiste Vibett (menuisier-ébéniste) in Paris, who was confirmed as a maître in November 1776. See Vibert’s accounts and the plans for the palazzo by Petitot, the French architect, held in the Museo Glauco Lombardi, Parma. 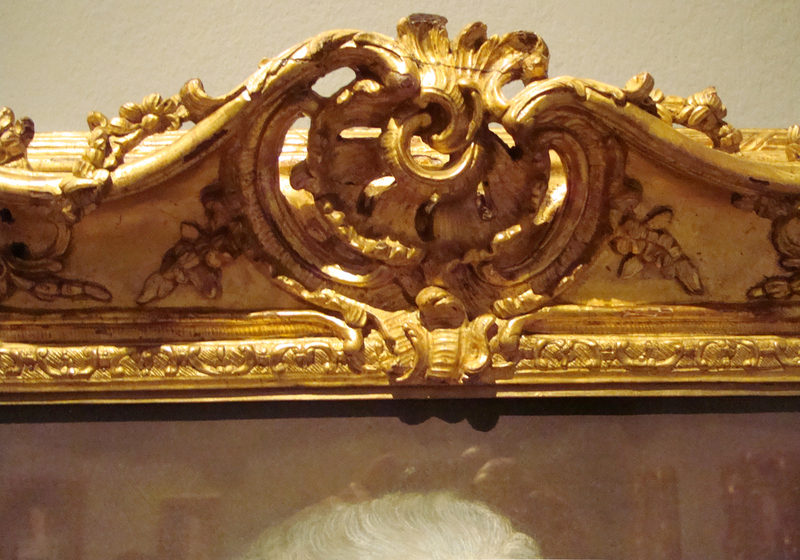 This band of hatching cut in the gesso, between the main scotia and the sight moulding, only decorates the frame of Louis XV’s portrait, and not the others. Two more frames for Monseigneur, at 39 the piece £ 78 ’. See Jacques-Augustin Galiffe, Notices généalogiques sur les familles genevoises depuis les premiers temps jusqu’à nos jours, 1829. Two of the Genevan pastels do not have completely neutral surroundings; La femme à la jacinthe is seated on a ballon back chair, at a table (although the space behind her chair then dissipates into Liotard’s usual infinite nothingness); and Mme La Live d’Epiney sits in an armchair. None of the pastels retain their original glass to my eye. Thank you for such a kind comment, Betty; it was a very interesting article to write, but sadly rather deficient in conclusions as to craftsmen (other than Vibert). Neil Jeffares hopes it may be possible to penetrate the way Swiss records are indexed, at some point, when perhaps the Genevan framemaker may emerge. As to glass, Jacob – as you see – has very kindly replied, and this was also Paul Mitchell’s conclusion. Even where the frames themselves haven’t been changed, I think that better glass and new slips would have been inserted by dealers as a matter of course. What a gift for all lovers of picture frames!